Just arrived in Tonga. Have now crossed the date line (even though only at 174W) are now in time zone GMT +13. We saw a humpback and calf on the way into Va'vau this afternoon. The Va'vau island group is a bit of a maze - the anchorage is a 'hurricane hole' and is very pleasant. Hundreds of boats here as all waiting for window to head to New Zealand. We are thinking to head off a bit early - early passages will have an increased chance of bad NZ weather (it is still spring there), but hopefully avoiding the possibility of an early cyclone. We have been doing some cycling, walking, swimming and are getting to know the place having been here about 4 days. There is incredible water visibility so the sea bed visible at 40m, some of the guides claim 70m. The islanders are just recovering from cyclone Heta which hit in Jan this year - 280km/hr winds - many houses destroyed and others left derelict as people emigrated to NZ. We've had very good sailing since Bora-Bora - we delayed a bit in Palmerston until the winds filled in properly. We will be leaving for Tonga tomorrow if the wind is ok - it is only about 240 miles to Vavau so we should make it in around two days. We have met up with a the Norwegians on 'Swany' and the French guys on 'Bubu', that were in Palmerston with us. On our arrival on the quay, Bubu's skipper offered us some free diesel "left over" from the Tahitian workers that had been helping to repair the hurricane damage. He knew the workers as he worked as a diver in the construction industry in Tahiti and before that in Muraroa (the French nuclear test site). Apart from any scruples of using diesel meant as aid, we have only used diesel for generating electricity since Huahine and our tank is pretty full. We heard this morning on the "Poly Net" that a weather front is about to strike Nuie "with a vengance" - though the feature is barely visible, and not at all dangerous looking, on the chart we got this morning. At midday the wind backs slowly around - all 5kts of it - and by the evening we are back in the trades. Amazing! Glad I didn't take it too seriously. This has been a pattern for the last few weeks - everyone has started to think about the trip to New Zealand and consequently takes a greater interest in the weather as there is the potential for serious weather on that route. Shame the talk isn't more constructive! We have been in Palmerston Island since Tuesday. It is an amazing place - the atoll is medium sized at about 10miles long, consisting of one main island and three others joined by a reef. 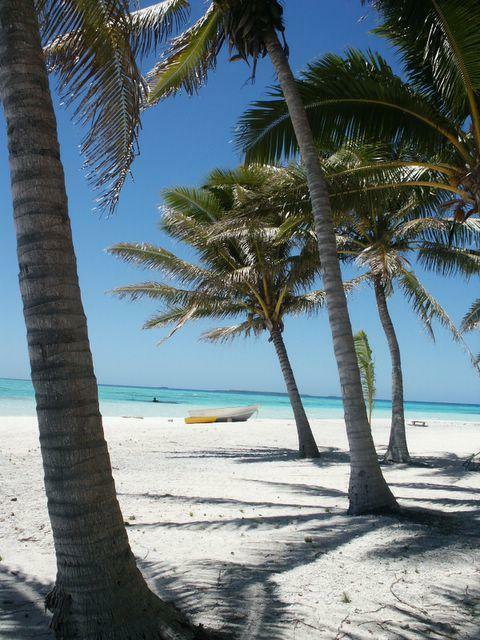 it is the most beautiful place we have seen, incredible white sand and seas of many different shades from white to turquoise to deep blue. Only about 50 people live here, all one family and mainly descended from a Brit who moved here in 1862 and his three native wives. With few exceptions, everyone can trace their ancestors back to this original William Marsters and one of his three wives, on one side and usually on the other as well. Makes for interesting family trees and long, double answers to the question "how is so-and-so related to you". Interestingly they don't all look the same though, there is a recognisable look to each branch of the family. Palmerston is part of the Cook Is. It is fairly isolated - they get a mail and supply boat 3-4 times a year, they got a phone installed 3 months ago and now have email. even so they rely on yachts to a large extent to bring goods up from Rarotonga - which is part of the reason they are so welcoming to yachts. The people are incredibly hospitable - they come out and help you anchor (we are on a mooring on the reef, being held off the reef by the wind and are effectively in the ocean, in fact the reef drops down to ocean depths about 1 metre behind the boat, makes for amazing snorkelling just off the boat), assist you coming ashore (the pass is winding and has a strong current - too strong for our outboard engine, and the lagoon is coral strewn), appoint a family as host for your stay, who basically adopt you - providing you with a daily meal, give you fresh fish for your dinner on board, as if we could eat after their huge lunches, bringing you fishing, letting you use their washing machines, feed you coffees at all times...it really is fantastic. They all speak good English with a strong NZ accent, and are both very interested in you and in telling you the islands history. There are many kids, mostly aged 3-10, and the local schools is very active even though it's only got the one class room. They invited me to listen in on the Maori class for the young ones and it was great fun. The language is v. difficult and i only remember a few words: puaka for pig, abii for school, puakoakoa for dog, kirikiri for black, ruaroa for hair, and many other funny sounding words. The fishing is incredible - fishing by line means a fish every few minutes, fishing by net from a small boat means you can catch several hundred in no time (the first night we were here they caught about 200+ fish, three heaped wheelbarrows full in two hours and then cleaned and filleted the fish in another two hours with the whole family helping, a real fish factory). We have caught parrot fish, trevally, what they call rock cod and also snapper. It difficult to see how they might over fish even by netting several hundred a week as they are fishing the ocean which spills into the lagoon at every tide. One unusual thing about being anchored in deep water is the presence of whales in the anchorage. Conor saw a whale the other morning and we saw another this evening as we were having a cup of tea (are now all out of any alcohol having given our last 6 beers to the locals, along with lots of novelty food - pasta, instant mashed potato, risotto, kidney beans, chocolate, tiktaks) We were woken up last night by a whale blowing out very close to our boat - very spooky! We didn't intend to stay more than one night, but have been here for almost a week and are finding it hard to leave. 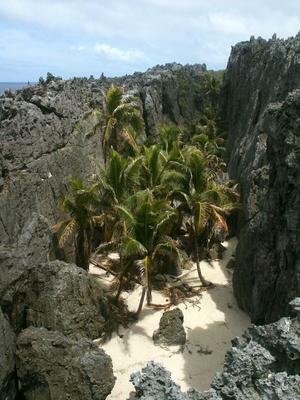 Our next stop is Nuie - maybe stay a week - and then head for Tonga. We are standing off Palmerston Atoll at the moment and will anchor there tomorrow morning. It is a bit of an odd place - everyone is descended from one guy (English - I think) and his 3 wives. Current population is 52. Some friends of ours briefly stayed here last week and said it was fantastic - locals very welcoming. There is no entrance to the lagoon for yachts - so you must anchor off the lee of the lagoon - which will be interesting. Consequently I dont think we will be staying long. Niue will be the next place - supposed to be interesting, but again problem to find anchorage, you anchor in a roadstead to the W of the islands. Only suitable in trade wind conditions. Also realised about being halfway around (from Greece) - we're on our way home now! The night before we left Bora Bora, we splashed out on a drink in "Bloody Marys" and discussed tactics. Henrietta was keen to get some heavier-weather sailing in before the passage to NZ, and this looked like it might be a good time to get it. We also elected to take the route via Palmerston and Nuie, as over the last few weeks the wind seemed to be slightly stronger than on the alternative Suvarow/Samoa route. While the wind was in the 25kt range, gusting higher, the outlook was good. We started out with 25kts on the beam, doing 7kts for the first 5 hours - which is as fast as we ever go. It then rose overnight - up to about 40kt. It was mostly on the beam and the sea state was reasonable. It was a good decision to leave when we did as when the wind eased, it disappeared completely around Bora Bora, leaving the boats who stayed behind facing calms. This morning we passed close to Aitutaki, one of the Cook Is. but decided not to stop as the check-in fees on a sunday are 3x the overtime rate, so it would have been expensive to clear-in. The winds are good, so it easy to press on to Palmerston where we might arrive tomorrow evening or the following morning. The Lions were there last week and said it's like nowhere else they've been, so i'm very curious. Imagine a community made up of one family! Apparently they don't get any visitors and even then only boats and they are therefore very welcoming. We will probably only spend a few nights in Palmerston and then head to Nuie, a little island between Palmerston and Tonga. We are still cruising around the Society Islands and are now in Bora Bora, about 100 miles west of Tahiti. We have visited most of the islands. They are all beautiful and rank as one of the most interesting places we have been to. They are high, green, volcanic peaks surrounded by a lagoon with a fringing reef. Most of the islands have 2 or 3 passes into the lagoon. The reef gives protection from the ocean swell, which you can still hear booming outside, but inside it is calm as a lake. 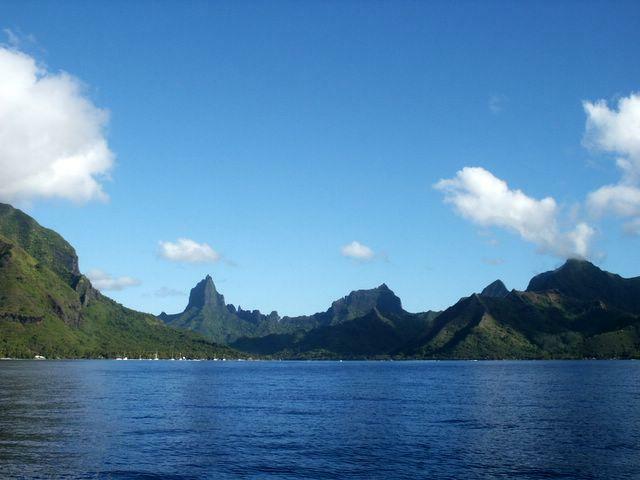 We did not see much of Tahiti itself - basically just the town of Papeete and some of the anchorages. Moorea and Huahine are the most beautiful of the island group - possibly not as spectacular as Bora Bora but they are less touristy, more rural and with lower key development they are more charming. Today we cycled right around Bora-Bora - which is about 30km. Bora Bora does have the most spectacular lagoon of all the islands - miles of turquoise water and loads of beaches. There is excellent snorkelling on the reefs and in the passes. We have been doing some wake boarding (like waterskiing with one board) behind Lionhearts dinghy which has a more powerful outboard than we have (we only have a 2hp - it gets us around - but slowly!). We will probably head off in the next day or so to either: Suvarov, Palmerston Atoll, Niue or direct to Tonga or Samoa. We will decide en route depending on the weather, which looks like it will be windy for the first couple of days.